When terminals tc and cg of the dlc3 are connected, the dtc is displayed by blinking the srs warning light. The srs is equipped with a voltage-increase circuit (dc-dc converter) in the center airbag sensor in case the source voltage drops. 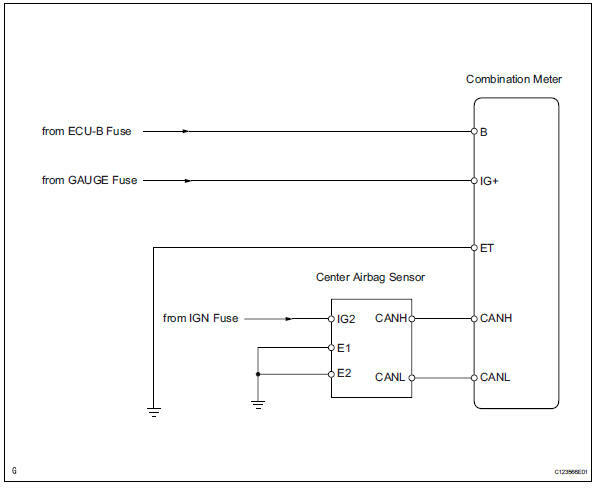 A malfunction in this circuit is not recorded in the center airbag sensor . The srs warning light automatically goes off when the source voltage returns to normal. The signal to illuminate the srs warning light is transmitted from the center airbag sensor to the combination meter through the multiplex communication system. Measure the voltage of the battery. Check that the connectors are properly connected to the center airbag sensor and combination meter. 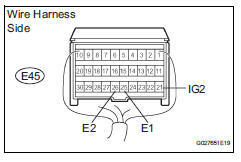 Disconnect the e45 connector from the center airbag sensor . Operate all components of the electrical system (defogger, wipers, headlight, heater blower, etc.). 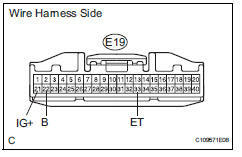 Disconnect the e19 connector from the combination meter. Connect the e19 connector to the combination meter. Check the srs warning light condition. Ok: after the primary check period, srs warning light goes off for approximately 10 seconds, and turning it on is continued. The primary check period shows approximately 6 seconds after the ignition switch is on.